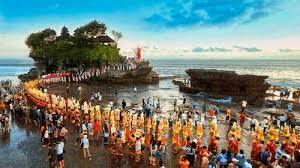 A full day tour to visit: TAMAN AYUN TEMPLE, the royal family temple at Mengwi Village then continue to visit TANAH LOT TEMPLE, the Temple in the sea with beautiful ocean panorama. Then the trip continue to visit GWK, Garuda Wisnu Kencana Cultural park. The next stop is ULUWATU TEMPLE, Temple on the rock cliff with beautiful sunset panorama, continue to see the unique balinese traditional performance KECAK and FIRE DANCE. The last journey is to enjoy grilled seafood dinner at JIMBARAN BAY, the romantic seafront seafood restaurant. Uluwatu : Temple on the cliff in southern part of Bali with the fantastic sunset panorama. Kecak & Fire Dance : The dance backgrounded the fantastic sunset panorama.